It was great to be back out there. You know, it was definitely nerve‑wracking, especially playing an opponent that I know how talented she is and first match back. But, you know, I was able to get a great start and settle in and play well against, you know, a really difficult opponent. I definitely wanted to come out focused, so that was definitely an ideal, ideal start. I’m glad it happened that way. I mean, just to be in this tournament is a huge win for me; just to be here is a win. You know, that’s what I told myself going in, that this is a win. I have nothing to lose. Just, you know, to gain. Just to get back at this level is a win for me. Well, I feel like a person that has an autoimmune disease. You know, for me, I’m not gonna probably feel like everybody else. But for me, my personal best is to give 100%. Why doesn’t anyone ask him a question? He goes everywhere with me. He’s a Havanese. He’s my baby. TPN: If you have to give from 1 to 10 how you played today, what would you give? 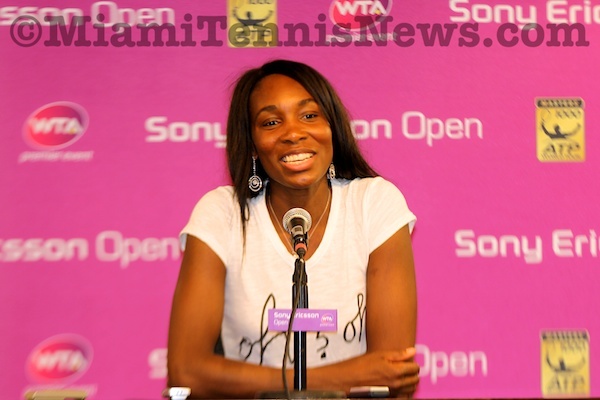 VENUS WILLIAMS: I was happy with how I played today. I wasn’t sure how I was gonna come out. I mean, I’m always positive, but it’s definitely hard to play the first match. Q. Would you say 11? VENUS WILLIAMS: Yeah, 11, awesome. I’m confident I will give it 110%. My goal is to peak for the Olympics. Like just to win a match helps me in my goal, and to win another match helps. So the good thing is that I’m playing well. I know how to play, so I haven’t lost any steam in that, you know, the fact that I can play tennis. So that’s really comforting. On Diet: I started eating raw, and I started eating vegan. And I also cheat. So I’m a chegan. It’s just that I might find something on someone else’s plate that I in that in my past life I was accustomed to eating, so that’s what cheaganism is all about. It’s a crossover. I’m not perfect. It’s hard to change your life completely, but I think it’s definitely worthwhile. I think it’s helped me. It’s definitely a lifestyle that is good for me so I can play pro. On whether or not she’s confident about receiving an Olympic Berth: Yeah, I have been talking about the Olympics ever since I played the first one, so, um, for me there’s no limits to what I can achieve. Even if, you know, the odds aren’t in my favor I have still been able to do really well. So I believe I can do it. So just stay tough, I guess. Williams will play No.3 seed Petra Kvitova in the second round. There only meeting came four years ago in Memphis when Kvitova stopped the American in three sets. Bracing that tennis injury. New from BRD Sport. Olympic tennis fashion: Lisa Raymond + Varvara Lepchenko pump up the flag (and economy) in Eliza Audley. 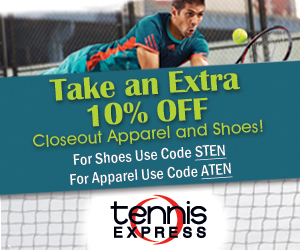 New men's tennis fashion from Loriet.